Resources can be protected by several security checks. In such a scenario, the MobileFirst Server sends all the relevant challenges simultaneously to the application. A security check can also be dependent on another security check. Therefore, it is important to be able to control when the challenges are sent. For example, this tutorial describes an application that has two resources protected by a user name and password, where the second resource also requires an additional PIN code. Prerequisite: Read the CredentialsValidationSecurityCheck and UserAuthenticationSecurityCheck tutorials before continuing. Create two security checks: StepUpPinCode and StepUpUserLogin. Their initial implementation is the same as the implementation described in the Credentials Validation and User Authentication tutorials. In this example, StepUpPinCode depends on StepUpUserLogin. The user should be asked to enter a PIN code only after a successful login to StepUpUserLogin. For this purpose, StepUpPinCode must be able to reference the StepUpUserLogin class. The MobileFirst framework provides an annotation to inject a reference. Important: Both security check implementations need to be bundled inside the same adapter. To resolve this reference, the framework looks up for a security check with the appropriate class, and injects its reference into the dependent security check. If there are more than one security check of the same class, the annotation has an optional name parameter, which you can use to specify the unique name of the referred check. STATE_ATTEMPTING: A challenge has been sent and the security check is waiting for the client response. The attempt count is maintained during this state. STATE_SUCCESS: The credentials have been successfully validated. STATE_BLOCKED: The maximum number of attempts has been reached and the check is in locked state. The current state can be obtained using the inherited getState() method. In StepUpUserLogin, add a convenience method to check whether the user is currently logged-in. This method is used later in the tutorial. The SecurityCheck interface defines a method called authorize. This method is responsible for implementing the main logic of the security check, such as sending a challenge or validating the request. The class CredentialsValidationSecurityCheck, which StepUpPinCode extends, already includes an implementation for this method. However, in this case, the goal is to check the state of StepUpUserLogin before starting the default behavior of the authorize method. If the state is STATE_SUCCESS (the user is logged in), the normal flow of the security check continues. If StepUpUserLogin is in any other state, nothing is done: no challenge is sent, neither success nor failure. Assuming the resource is protected by both StepUpPinCode and StepUpUserLogin, this flow makes sure that the user is logged in before being prompted for the secondary credential (PIN code). The client never receives both challenges at the same time, even though both security checks are activated. //In any other case, process StepUpUserLogin instead. In the StepUpPinCode security check, you are interested in knowing the current user’s ID so that you can look up this user’s PIN code in some database. On the client side, there are no special APIs to handle multiple steps. Rather, each challenge handler handles its own challenge. In this example, you must register two separate challenge handlers: one to handle challenges from StepUpUserLogin and one to handle challenges from StepUpPincode. The StepUpUserLogin and StepUpPinCode security checks are available in the SecurityChecks project under the StepUp Maven project. Click to download the Security Checks Maven project. 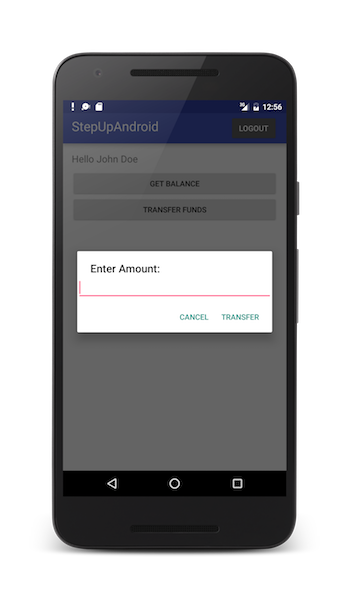 Sample applications are available for iOS (Swift), Android, Windows 8.1/10, Cordova, and Web. Click to download the Windows 8.1 project. Click to download the Windows 10 project.